The Camel and Artichoke is a traditional establishment with a contemporary edge, serving a range of classic dishes on an extensive food menu. In the summer the heated garden is perfect for some alfresco dining. Do you work at Camel and Artichoke? Heated beer garden with seating for up to 60 people. What did you think of Camel and Artichoke? Lower Marsh might not be the kind of place many people seek out but this is certainly one of the better pubs if you happen to be nearby. This little strip is a bit of a strange one, and although there’s the ever-so-incongruous party vibes of Cubana at the end, the Camel and the Artichoke is the only decent pub down Lower Marsh way. It’s nice and cosy inside with a pretty slim space just about big enough for the sofas and the few tables on the way to the bar, as well as the couple toward the back. There’s an upstairs area, which is better for dining, and a great little garden that does get rather busy – Waterlooers love a fag. There’s something about Waterloo venues, in that staff and clientele usually seem to be really lovely. It’s the same here, with those behind the bar incredibly courteous to similarly affable drinkers (many look like locals). Perhaps that explains why it’s always pretty busy – and even busier when the football is on and the big screen plays a big match. The outside area has large umbrellas, so it remains lively all year round. Much like the pub itself, it’s not the kind of food you would go out of your way for, but it’s bound to be better than most around here, and is good for lining the stomach when needed. Sausage and mash (£8.25) is fine, as is a standard burger (£7.50) served in a square ciabatta with chips and salad. The Big Ben Burger is certainly worth trying if you’re a greedy sort – it’s a stack of two patties with cheese, bacon, tomato, onion and a fried egg: excellent value at £8.95. Baguettes (all £6.50) and jacket potatoes with various fillings (all £5.75) all seem pretty popular too, especially with the after work crowd. Portions throughout are huge. Such is the volume of beer being sold that all are pretty well kept, and the ales on rotation can be really interesting. When they’re not, though, they’re still popular drops such as Doom Bar and Hobgoblin (both £4.25), and they still have plenty of life and freshness. Lagers (£3.95-£4.75) are standard (Peroni, Kronenbourg, Amstel), and Guinness (£4.50) is kept in just as good condition as the ales. There’s not a huge selection but plenty enough for most people. 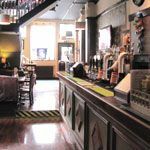 The friendliness of the Camel and Artichoke is certainly one of its main draws – along with that garden and the sofas – and while it might not be the best pub in London, it could well be the best in Waterloo.